The Cordoban Caliphate began in 929, when ‘Abd al-Raḥmān III proclaimed himself caliph of al-Andalus and broke completely with the ties that still united him to the East world. Under his authority, the building activity within the medina did not cease. Improvements were made in the southern wall with a clear propaganda function. In the same way, various works were carried out in the Citadel (Alcazar). Some of them were developed in what is known as the Patio de Mujeres, and others, in the northern enclosure walls of the complex, at the Garaje Alcazar site, including a nearby baths for the use of the caliph, preserved today in Campo Santo de los Mártires. Details of the maqsura and access to the mirhab of the Aljama Mosque (AST). Throughout the government of ‘Abd al-Raḥmān III, the northern façade of the Great Mosque was also reinforced and its courtyard expanded, forcing a new minaret to be erected to replace the previous one. 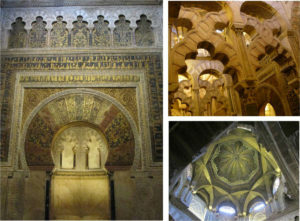 Years later, the prayer room underwent its second extension by order of its successor, the caliph al-Ḥakam II. The miḥrāb and the maqsura that can be contemplated nowadays were planned in this moment. In line with this remodeling, a new raised passageway (sābāṭ) was constructed, since the ancient corridor built by the emir ‘Abd Allāh in the 9th century would have been demolished. Another action taken by al-Ḥakam II was the creation, to the east and west of the Great Mosque, of four ablutions rooms in 967. That same year, a water channel was inaugurated (later called “Aguas de la Fábrica de la Catedral “) to supply the area surrounding the Mosque. This conduit reused a Roman aqueduct in its origin, located under the bus station of Cordoba. Finally, in the year 971, al-Ḥakam II also reformed the old Roman bridge. Repairs were made in its foundations and in several pillars, and by the end of the 10th century, its southern end was fortified with a defensive gate. This structure became later in the Tower of Calahorra, in which the primitive horseshoe arch of the caliphal access is still visible. 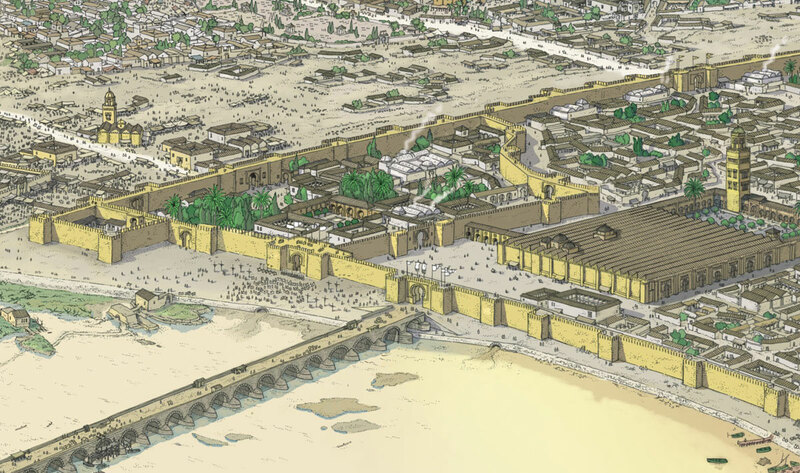 In addition to the performances within the walls, the great urban transformation of Madīnat Qurṭuba took place in its peripheral areas, particularly in the western area, known by written sources as al-Ŷānib al-Garbī. The new economic and socio-political parameters of the Umayyad Caliphate, along with the considerable increase of population registered according to its attractiveness as capital of al-Andalus, were configuring a densely occupied space outside the city. 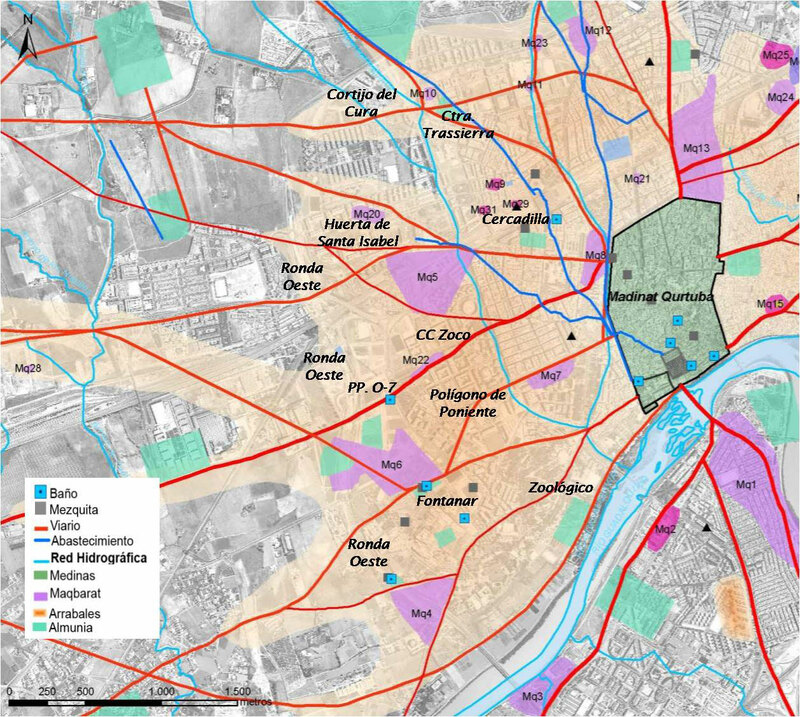 The material remains indicate that most of these quarters were the result of previous urban plans. The State could have been involved initially, but it is difficult to determine who their real builders were and the role that other promoters could have played. View of the excavated parts of the Alcazar of Madīnat al-Zahrā ‘(VALLEJO, 2010). The founding of Madīnat al-Zahrā between 936 and 940, seat of the State administration and official residence of the caliph, was the definitive impulse of this great suburban sprawl. Just as it had been a tradition in the Islamic Middle East, one of the prerogatives of the new caliph was the foundation of a new city. 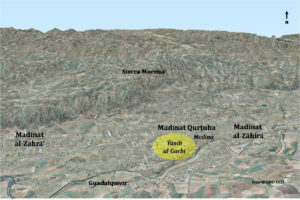 In this case, ‘Abd al-Raḥmān III chose a strategic site at the foot of Sierra Morena mountains, west of the Cordoban medina, only separated by 8 kilometres. Between the palatine city and Qurṭuba, these suburban areas grew, in whose development played a vital role the preexisting ways and the new roads created on purpose to communicate both cities. Together with the domestic areas, these neighborhoods were equipped with common amenities and State facilities. Nevertheless, the Cordoban emirs -as well as their relatives and some senior officials- had already participated in the construction of these areas since the second half of the 8th century through different pious actions. These foundations acted as centres of urbanization of the new districts from the 10th century. 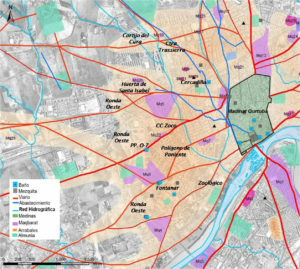 In fact, some emiral munyat-s were surrounded by these caliphal neighborhoods due to the urban growth. Others were readapted, as al-Nā’ūrah, which underwent probably a process of renewal since the villa turn into an overnight shelter and a reception centre for the delegations arriving at Madīnat al-Zahrā in caliphal times. To the north zone, large properties like Arḥā ‘Nāḥiḥ or al-Rummāniyya emerged, as well as the settlement of Turruñuelos, still to be excavated, but identified by some scholars as a place for the cantonment of the troops. Slum sector excavated in the surroundings of the Trassierra Road (GMU-UCO Agreement). 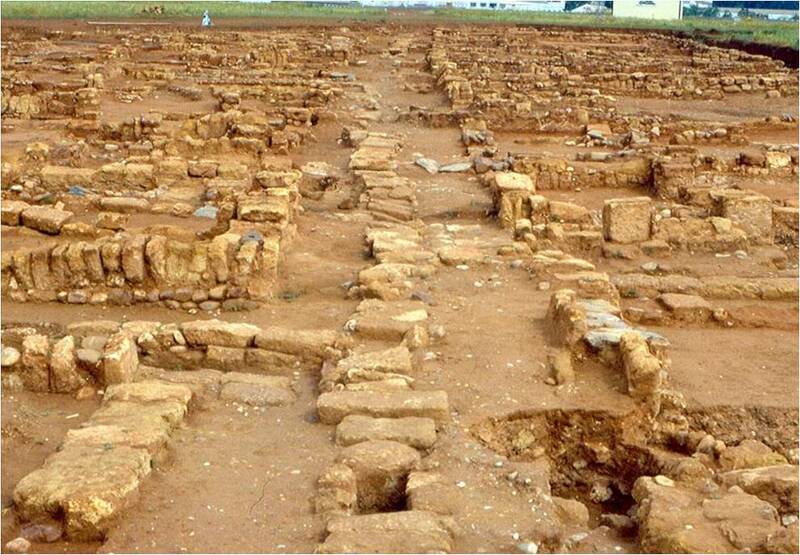 In the northernmost area of Ŷānib al-Garbī, in the immediate vicinity of the current Cortijo del Cura and the Trassierra Road, part of the ancient suburb of al-Ruṣāfa has been documented, consisting of dwellings, pottery production areas and a cemetery. To the southwest, in the Huerta de Santa Isabel area, the archaeological works have brought to light a regular urban planning belonging to the caliphal period too. 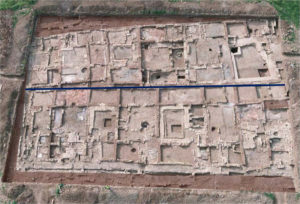 In the archaeological site of Cercadilla, another one of the most complete districts was registered, which, besides houses and industrial spaces, had at least one small mosque. 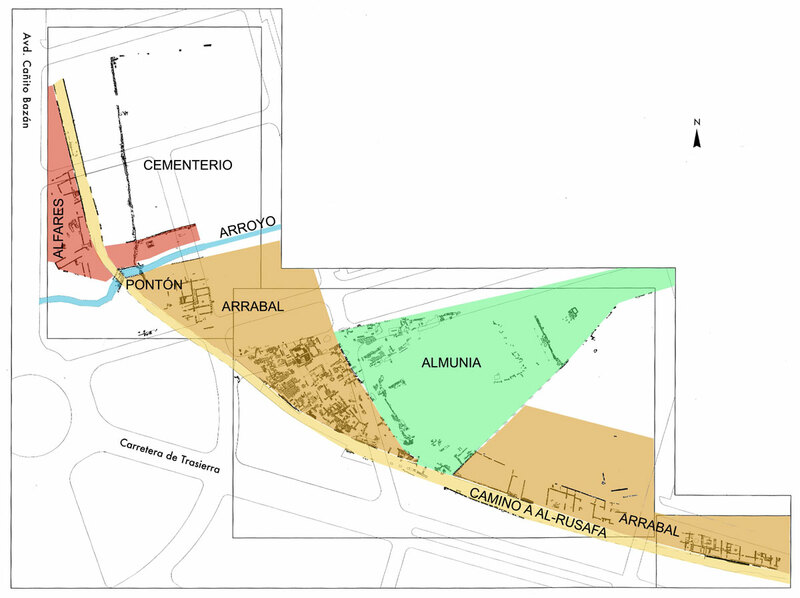 Documented Neighborhood under the current Poniente Sports Center (GMU-UCO Agreement). In the central sector of Ŷānib al-Garbī, corresponding to the surroundings of the current Zoco shopping mall, is where the largest extensions of suburbs were settled, in an area perfectly urbanized and provided with all kind of facilities. 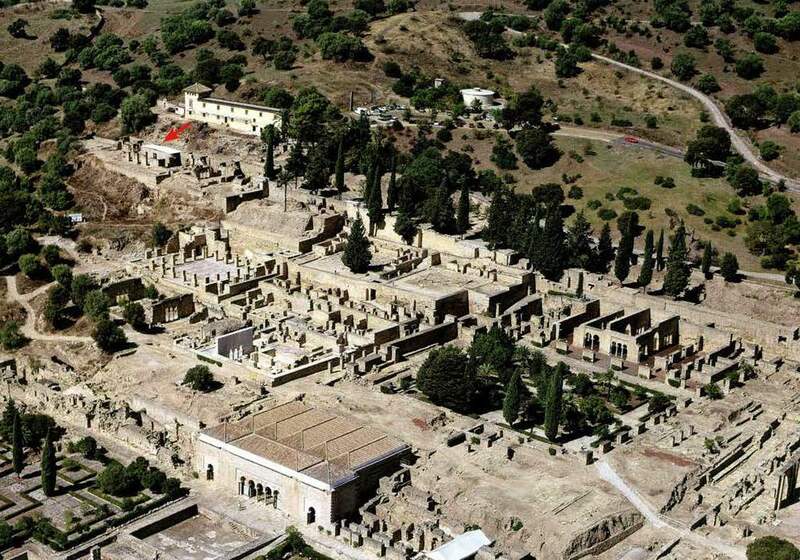 To the south, between the Fontanar de Cábanos and Menéndez Pidal avenue, other suburban contexts have been discovered, with residential areas, bath houses, mosques, cemeteries and munyat-s. Under the Zoological Park of Cordoba, in Colina de los Quemados, some structures from the caliphal period have also appeared. 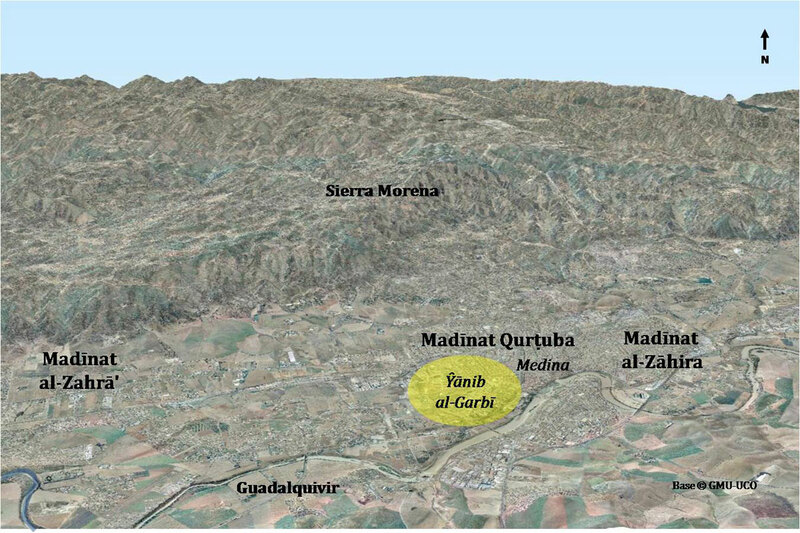 At the opposite extreme, to the east of the Cordoban medina, another series of suburban quarters were established during the Umayyad Caliphate, although the available archaeological information is quite limited and we hardly know details of its urbanism. The small excavations carried out in the area -known in Islamic times as al-y̌iha al-Šarquiyya- have detected domestic spaces that should not have been very different from those found in the western suburbs. What it seems logical to think is that the urban development of the eastern lands was related to the foundation in this sector of the city of Madīnat al-Zāhira, whose construction was commissioned by Almanzor at the end of the 10th century. This fact is evidenced by ibn Hazm when he mentions his new houses in the suburb of al-Zāhira. Archaeological research, however, has not been able to find yet any trace of this medina, and we only know of its existence through written documentation. Finally, the rupture of the symbolic and propagandistic foundations on which the caliphal State was sustained occurred around the year 1009, when a period of instability that lasted until 1031 began. The outbreak of the fitna (civil war) resulted in the plunder of Madīnat al-Zahrā’ and Madīnat al-Zāhira. 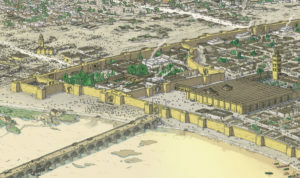 The military contingents that attacked Qurṭuba, especially the Berber troops who besieged the medina in the year 1010, also destroyed the western suburbs, causing a retreat of the inhabitants inside the walled enclosure. Only the eastern suburbs could have kept occupied -although with a very reduced population- thanks to the fortification of its perimeter with a very rudimentary wall. After the civil war, Madīnat Qurṭuba was involved in a series of constant political and social transformations. The history of the medina during the kingdoms of Taifas -specifically during the brief republic of the Banū Ŷahwar (1031-1070)- contrasted rapidly with the splendor known until then.